Dan May from Blackmagic Design and I had a quick chat about the URSA Mini Pro 4.6K G2. 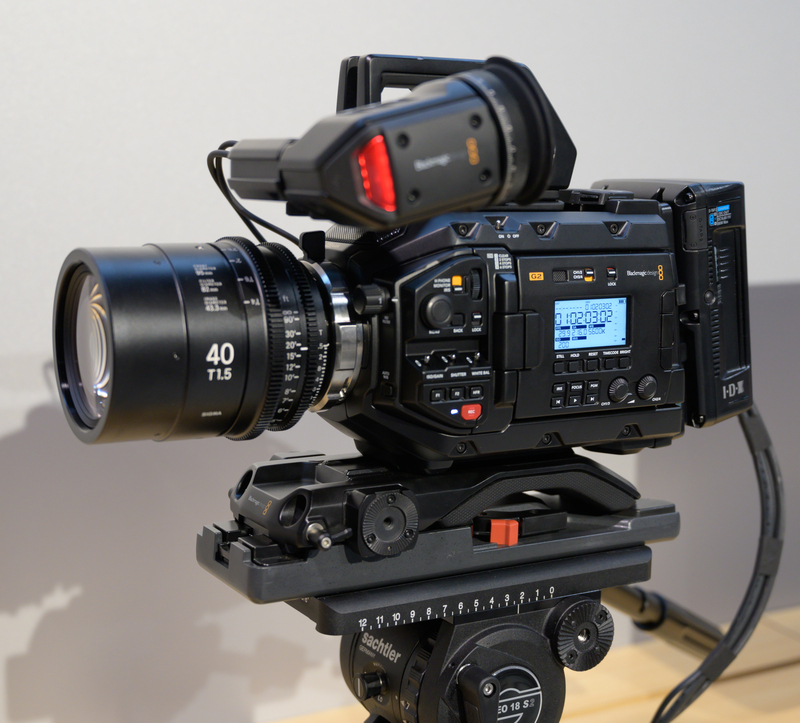 While the URSA Mini Pro G2 is not necessarily new to NAB 2019 it might as well be new to the show. Rarely a person has seen one on sets or shoots since the camera’s original announcement. Shipping for the updated URSA Mini Pro started right around the time NAB 2019 began. 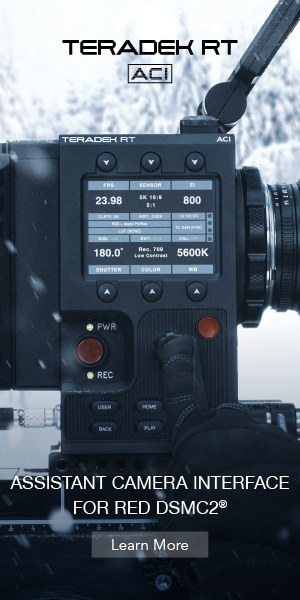 The new URSA Mini Pro 4.6K G2 is an advancement over the original model as it now features entirely new electronics for higher speed processing. Also included is a new Super 35mm 4.6K image sensor that captures up to 4608 x 2592 pixels with 15 stops of latitude at up to 3200 ISO. This new electronics for faster processing means you can record 4.6K images at up to 120 frames per second, windowed 4K DCI at up 150 frames per second, and windowed 1080 HD at 300 frames per second. In addition, URSA Mini Pro 4.6K G2 can capture Blackmagic RAW images in both film and extended video modes, making it a little easier for shooters to hand off footage to editors and producers without the need to color correct prior. Blackmagic RAW is a revolutionary, next generation codec that gives operators visually lossless images, extensive metadata support and highly optimized GPU and CPU accelerated processing. Blackmagic RAW combines the quality and workflow advantages of traditional RAW formats with the speed and ease of use of standard video codecs. With Blackmagic RAW, you can choose compression levels up to 12:1. Blackmagic RAW settings such as 12:1 are important to allow customers to get the highest frame rates from the camera, and this means only Blackmagic RAW can allow high frame rates while retaining enough quality for professional results. URSA Mini Pro 4.6K G2 also uses Blackmagic Design Generation 4 Color Science for superior imaging that results in extremely accurate skin tones and gorgeous, lifelike colors that rival those of cameras costing tens of thousands of dollars more. Blackmagic RAW images are encoded using a custom non-linear 12-bit space designed to provide the maximum amount of color data and dynamic range. These formats can be recorded onto CFast or SD cards, as well as direct to flash disks using the new USB-C expansion port. Featuring both dual C-Fast 2.0 recorders and dual SD UHS-II card recorders, operators can choose the media that works best for their projects. C-Fast cards are ideal for full resolution Blackmagic RAW 12 bit recording, while UHS-II SD cards are inexpensive and commonly available, making them perfect for recording Blackmagic RAW 8:1 or 12:1 for Ultra HD and regular HD files. URSA Mini Pro 4.6K G2 also includes a new and innovative high-speed USB-C expansion port for adding accessories such as an SSD for external recording. That means you can now record for even longer durations without stopping if you feel comfortable using a cable to USB-C SSD as your main media. Super 35mm 4.6K sensor with Blackmagic Design Generation 4 Color Science. Supports project frame rates up to 60 fps and off-speed slow motion recording up to 120 fps in 4.6K, 150 fps in 4K DCI and 300 fps in HD Blackmagic RAW. High quality 2, 4 and 6 stop neutral density (ND) filters with IR compensation designed to specifically match the colorimetry and color science of Blackmagic URSA Mini Pro 4.6K G2. Fully redundant controls including external controls which allow direct access to the most important camera settings such as external power switch, ND filter wheel, ISO, shutter, white balance, record button, audio gain controls, lens and transport control, high frame rate button and more. Built-in dual C-Fast 2.0 recorders and dual SD/UHS-II card recorders allow unlimited duration recording in high quality. High-speed USB-C expansion port for recording directly to an external SSD or flash disk. Support for Blackmagic RAW files in Constant Bitrate 3:1, 5:1, 8:1 and 12:1 or Constant Quality Q0 and Q5 as well as ProRes 4444 XQ, ProRes 4444, ProRes 422 HQ, ProRes 422, ProRes 422 LT, ProRes 422 Proxy recording at 4.6K, 4K, Ultra HD and HD resolutions. Supports recording of up to 300 frames per second in HD, 150 frames per second in 4K DCI, and 120 frames per second at full frame 4.6K. Built-in high-quality stereo microphones for recording sound. 4-inch foldout touchscreen for on-set monitoring and menu settings. Includes a full copy of DaVinci Resolve software color grading and editing software. 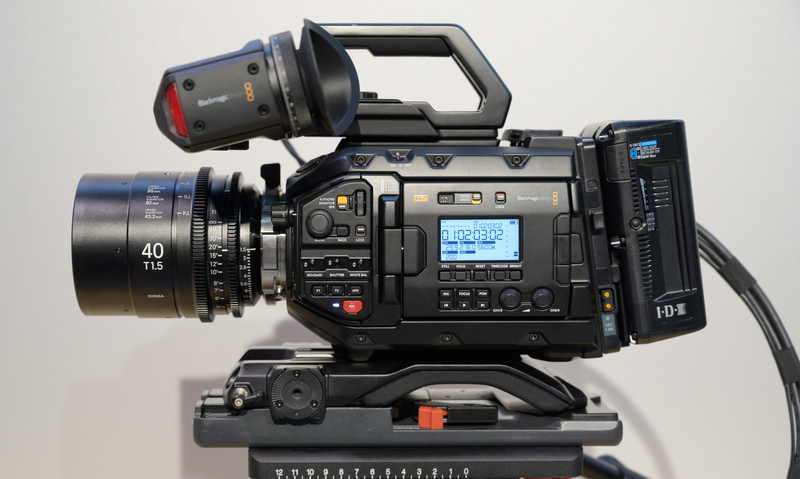 URSA Mini Pro 4.6K G2 is available now from Blackmagic Design resellers worldwide for US$5,995. Also available from resellers are the optional URSA Mini Pro PL lens mount for US$245, optional F lens mount for US$375 as well as the optional URSA Mini Pro B4 HD lens mount for US$385. URSA Mini Pro comes standard with an EF lens mount, and additional replacement mounts can also be purchased for US$175. Blackmagic URSA Mini Shoulder Kit features built-in rosettes, rail mounts, viewfinder mount, integrated tripod quick lock release and top handle. Blackmagic URSA Viewfinder is a high-resolution viewfinder that includes a full HD OLED display and true glass optics for perfect focus. URSA VLock Battery Plate provides a VLock compatible plate for attaching third-party batteries. Hey Brian,Did you get a chance to test it or talk to someone that shot with the G2? Also any accurate info of when shipping would arrive? 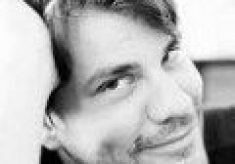 I talked to a G2 tester. He said the camera looks to be slightly, however very slightly, more sensitive to light, but now deets on shipping. Image is better too.